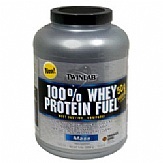 100% Whey Protein Fuel by Twinlab is a fast dissolving protein powder supplement that is designed to stimulate muscle growth. It is known to be a great post-workout protein that improves recovery and enhances muscle growth and the building of lean tissue mass. 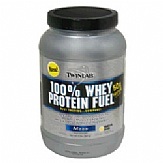 Studies show that 100% Whey Protein is one of the most critical anabolic muscle building proteins available. It provides a constant and rapid drive of amino acids to skeletal muscle tissue and as a result increases the anabolic effects of weight training. Twinlab offers a premier concentrate that is 100% instantized and quick dissolving. 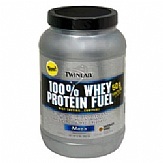 This excellent post-workout protein powder is easy to mix and boasts a rich and refreshing taste typically hard to find in protein powders. 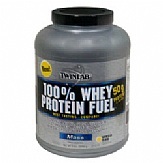 Twinlab’s 100% Whey Protein has one of the highest protein efficiency ratios and provides more amino acids than other proteins on the market. Each serving contains just 140 calories, 3 grams of fat, and 4 grams of carbohydrates. There are 25 grams of protein with each scoop. For the best results, it is recommended that you consume the daily protein allotment of 5-6 small meals spread out evenly throughout the day. Metabolism will be promoted. To encourage your body’s nitrogen balance, consume 1 gram of protein per pound of body weight per day from a mixture of high protein foods and supplements.